Western Barred Bandicoots are the smallest species of bandicoot, weighing approximately 220 grams. As with many species of Australian mammals, the distribution of Western Barred Bandicoots has contracted dramatically since European settlement. The primary cause of the disappearance of Western Barred Bandicoots is thought to be predation by foxes and feral cats. AWC successfully reintroduced Western Barred Bandicoots to Faure Island in 2005. AWC ecologists conduct annual monitoring programs, employing techniques such as spotlighting and trapping, to monitor the status of this population. A reintroduction of Western Barred Bandicoots to Mt Gibson Wildlife Sanctuary began in 2017. Monitoring to date indicates that this population is establishing well, with further translocations of this species conducted in 2018 and planned for 2019, Because of the large size of the feral predator-free enclosure on Mt Gibson, it is estimated that this project will increase the global population size of the species by 30%. 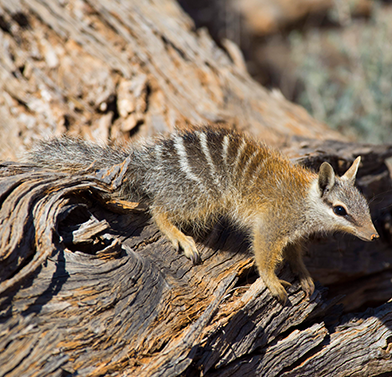 AWC further plans to reintroduce the species to Pilliga and Mallee Cliffs (NSW). 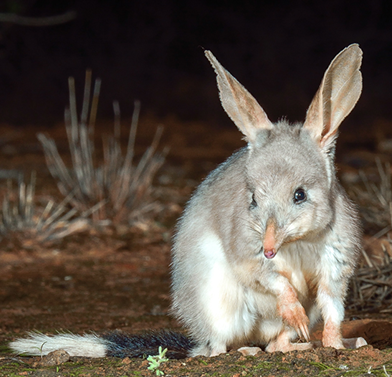 AWC contributes expert advice to the Shark Bay Mammals Recovery Team, which oversees nation-wide conservation efforts for Western Barred Bandicoots and other species. The primary cause of the disappearance of Western Barred Bandicoots from the mainland is thought to be predation by foxes and feral cats. In the past, modification of vegetation by land clearance, rabbits, stock and changed fire regimes would have accelerated declines. 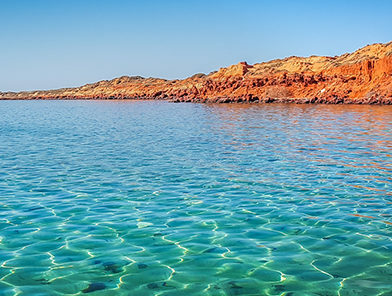 Current threats include the risk that feral predators will gain access to ‘mainland island’ populations, and reduced rainfall due to climate change which may adversely affect populations in Shark Bay. Western Barred Bandicoots are the smallest species of bandicoot, weighing approximately 220 grams. They are lightly built, have a long, pointed snout, large erect ears and a short tail that is sometimes lost in fights with other members of their species. The fur is a light grey-brown, with two or three dark bars running across the hindquarters. The chin, underbelly and feet are white. The Western Barred Bandicoot is a solitary, nocturnal animal that shelters by day in nests of litter. Animals are omnivorous, consuming a wide variety of invertebrates, some plant matter and, occasionally, small vertebrates. Each year, females are capable of raising up to four litters, each of between one and three young. Breeding is largely seasonal, triggered by the first substantial autumn rains, but can occur at any time of year when environmental conditions are good. Western Barred Bandicoots can live for at least four years in the wild. Their main native predators are raptors, owls, goannas and snakes. The taxonomy of the Western Barred Bandicoots is unsettled. Until recently, the Western Barred Bandicoot was considered to have a number of subspecies which, collectively, extended from NSW to Western Australia. A recent taxonomic revision has suggested splitting the Western Barred Bandicoot into six species, of which the only surviving taxon is Perameles bougainville, or the ‘Shark Bay Bandicoot’. As with many Australian mammals, the distribution of Western Barred Bandicoots (in the broad sense) has contracted dramatically since European settlement. The Western Barred Bandicoot (in the broad sense) was once common over much of the southern arid regions of Australia: from half-way up the coast of Western Australia and across the Nullarbor Plain, to arid and semi-arid regions in South Australia, Victoria and New South Wales. Western Barred Bandicoots became extinct on the mainland by the 1940s, surviving only on Bernier and Dorre Islands in Shark Bay, off the coast of Western Australia. The populations on these islands fluctuate dramatically in response to rainfall, combined estimates range from 900 – 4000 individuals. 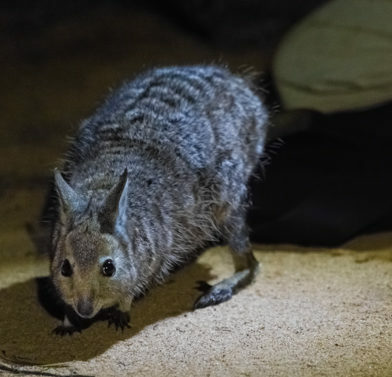 The Western Barred Bandicoot has been successfully reintroduced to AWC’s Faure Island Wildlife Sanctuary in Shark Bay and to a fenced feral predator-free area at ‘Arid Recovery’ in South Australia; these populations are persistent and self-sustaining. A reintroduction to AWC’s Mt Gibson Wildlife Sanctuary is currently underway, and reintroductions/ translocations are planned to Pilliga and Mallee Cliffs.